P20078260118	My tent on Ledge Hill. P20078260126	Crossing the first railway line. Description This was a very pleasant walk along the northeastern end of the Ridgeway to Ivinghoe Beacon, followed by the western end of the Icknield Way towards Whipsnade. Condition I am very tired after this long walk, but the biggest problem that I have had is with some insect bits that troubled me on the last stretch of the walk. Weather The weather today was bright and sunny, but thankfully was three or four degrees cooler than it had been yesterday. There was not much of a breeze to help me cool down. P20078260148	Looking across fields towards Chequers. P20078260164	The view from Coombe Hill. P20078260174	Looking back towards the Coombe Hill monument. P20078260188	A pond in Wendover. P20078260206	The view from the trig pillar in Wiggington. P20078260229	The view from Pitstone Hill towards Ivinghoe Beacon. Dawn awoke me from my slumbers quickly, and it took me a few seconds to realise where I was. The tent flysheet was damp with dew, and as I opened the flap to the tent I was greeted with a foggy vista, a dramatic change from the clear skies of the night before. I had awoken a couple of times during the night and had watches the stars overhead, interspersed occasionally with the navigation lights of aircraft flying overhead. I had slept like a log, and consequently I did not lie in for too long and got dressed and up before it was fully light. There was no-one about and the fog was thick enough to obscure the valley floor below, so I strolled around the hilltop for a while before packing my rucksack and getting ready for the long day ahead. As the flysheet was damp I put this on top of the main compartment of my rucksack, hoping that the sun would come out enough later for it to dry out. I had drunk more water than usual during the night and I was now slightly short, so a priority during the day would be getting enough water to see me through; the half-litre left in my bottle would not last too long if it got as hot as yesterday. I soon headed off and followed the Ridgeway as it immediately dived into a small patch of woodland before descending down hill further into the fog. The path was not too steep and soon levelled out as the legs of power line pylons emerged spectrally from the fog. A road was crossed, and a little further on there was a farm that had old farm machinery lined up neatly outside it. Next came a golf course and the first person that I had seen that day, a man spinning around on a ride-on lawnmower. Soon the trail crossed a railway line on the level, and I crossed the single track carefully, looking both ways before jogging across, shooting a photograph as I went. The path then climbed steeply uphill and crossed the top of a tunnel of another railway line, the line being visible in a deep cutting to my right. This was one of the later railway lines built, and I could not work out why one line was on the level and the other through the tunnel, considering they split and met up again within about a mile and a half - I will have to research this when I get home. On the other side of the tunnel the path entered a field and there were more power lines overhead, this time with scaffolding by the hedges, a sign that there is maintenance work going on, with the cables either having been dropped or getting ready to be dropped. 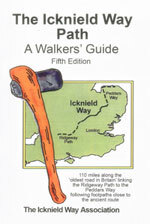 The path led onto a road, and I was surprised to see Icknield Way markers; I will hopefully be walking this trail later on today, and although the footpath starts off at Ivinghoe Beacon there are extensions to the route further westwards, which these waymarkers denote. The trail then joined the A4010 northwards towards Princes Risborough, and the traffic on this road was a rude awakening after the quiet and sleepy stroll so far. There was a pavement alongside the road so the walk was safe enough, but it was still a relief when the trail turned off the road to follow a track northeastwards immediately to the south of the town. It was tempting to divert into the town to see if I could buy some water somewhere but I soon decided against it and plodded on, crossing the road and following another track. This was soon left behind and a steep path led uphill to the east, the upper and steeper parts being stepped. I can imagine that the views from up here would be superb, but unfortunately the fog prevented me from seeing much further than a mile, buildings in Princes Risborough only just being visible. It was a relief when the climb was over, and a level path took me northwards towards the top of Whiteleaf Hill, occasionally passing through woodland along good, wide paths. At the top of Whiteleaf Hill there was a fire burning, a sign that some people had spent the night up here, and annoyingly in an adjacent tree stump there was a disposable barbecue and some empty beer cans. Not only had the campers not put out their fire, but they appeared to have left all of their litter behind as well. Disgusted I walked on as the path descended through woods to reach the road at Lower Cadsden. This seemed to be quite a pretty little place, and I found myself wishing that the pub was open so that I could buy a drink. There was a tap by one of the tables outside the pub, but as there was no way of knowing if it was drinking water I passed it by. Another climb followed uphill, and as the trail levelled off at the top of the hill I got my first glimpse of Chequers in the distance. The Ridgeway runs straight across the grounds of this residence, even when the Prime Minister is in residence, a fact that I find strangely reassuring in these times. To the left of the trail there was a low, sturdy fence with uprights made out of old flat-bottom rails, the sturdiness of these seeming strange considering the fence would be simple to climb over. I assume that it is to stop vehicles from driving onto the grounds of Chequers, but I doubt that even this sturdy fence could stop a vehicle. There was a security camera at the point where the path entered the formal grounds of Chequers, and the house itself went out of view as the trail crossed the grounds. To my left there was a fence that had strict warning signs hanging off it, and I started wondering exactly what security measures there were that I could not see. About halfway across the trail crossed the main driveway leading into Chequers, and again there were cameras nearby. To my right there were the beautiful black gates and a lodge, and once across the drive I continued on, passing another camera before the path dumped me out unceremoniously onto a road. A steep climb followed as the trail rose up, entering trees before levelling off and turning to had northwards. The early-morning fog had burned off by now, but the path through the woods was dark and gloomy, and I remembered a spooky daydream that I had had when walking through this area a few years before. The woods seemed to last forever, and it was a surprise when the path dumped me out onto the side of the hill, with superb views to the west and north. It was a short stroll from here to the Boer War monument on Coombe Hill, a magnificent structure that seemed to gleam in the sunshine. I paused to study the views from here for a few minutes, checking off the things I could see on the plains below me on the map. Eventually I set off once more on what was a pleasant and gradual descent eastwards down off Coombe Hill, and I could not help but look behind me occasionally back towards the monument. The gradient of the path eventually got steeper before suddenly ending at a road that headed on, crossing the railway line and A413 before reaching Wendover. By this time I was very thirsty, and it was a relief when I saw that there was a Budgens superstore in the town that was open. I went in and brought myself three litres of water and a bottle of orange juice before taking my pack off and sitting down on the bench outside. I drunk the last drops of water that I had left from last night, before filling up two of my inflatable water bladders from the bottles. I drunk the orange juice immediately to slake my thirst, and then relaxed, watching people walk around on this beautiful Sunday morning. Eventually I could not pause any longer and I had to head off, but first I stopped off to use the public toilets in an nearby car park. These were of a kind that I hate, a lack of toilet seats meaning that I had to sit on bare metal, but needs must and I set off again feeling a few pounds lighter. The path out of the town is fairly pretty, with a stream burbling away to the left of the path, and after passing a church a road, farm driveway and then track took me southeastwards. At Boswells Farm the track became rougher as it entered a large wood and started to climb steeply, a climb that seemed to last forever. A couple of mountain bikers roared past me downhill, and I was very relieved when the gradient slackened and I could actually maintain a better pace. The path wound through the woodland, and although it was nowhere near as hot as it had been yesterday it was still a relief that the trees kept the sun off me. However I found the walk fairly boring, and it was a welcome change when the trail emerged to cross fields on a path. At the end of this there was some construction equipment stored, but after crossing a road and passing a mast the trail entered some more woodland. The track through the woods was nice and wide and I managed to keep good time as I strolled along before the track ended at a road, which took me into the little hamlet of Hastoe. Walking along the road proved hard on my tired feet, but the road was soon left behind as the trail started following a broad track through Tring Park, trees again being present on either side of the track and obscuring the view except for a few places where there were benches and viewpoints. When the track ended at a road in Wiggington I had a decision to make; I was due a rest break, but last time I had been in Tring the pub / hotel by the station had been shut. As I met the road there were a couple weeding in their garden, and they told me that the pub in the village was probably open. This was marked on the map but was about half a mile away; eventually I decided to head towards it and set off down the road. It was a relief to find the pub was open and even better was the fact that it was still serving Sunday lunch. I ordered a pork roast and drunk a pint of bitter as I waited for it to arrive. The meal was brilliant; whether this was because I was exceptionally hungry or because of the quality of the food I do not know, but it was one of the best pub Sunday lunches that I have had for some time. I washed it down with a pint of lemonade, before heading back to the Ridgeway path. A few yards further along the path there was a trig pillar, and I listened to the end of the Grand Prix as the path descended down to a long footbridge over the A41(T) road. There were some pleasant views to be had on the descent, and these continued in patches as the path crossed another road before eventually reaching another road during Tring. On the next stretch of road a series of Rolls Royces of various vintages passed me, the chugging engine noises of the older cars sounding magnificent. This led me on to the bridge over the canal, and immediately afterwards I passed the closed hotel and then the station. This marked the last stretch of the Ridgeway, and I carefully made my way along the busy road before taking the footpath that headed northwestwards, soon entering trees as it climbed patchily, in places alongside the bank of Grim;s Ditch, which I had also walked along in part yesterday. The trees were left behind before the final gentle climb up onto Pitstone Hill, and as I walked I chatted to a couple who were alarmed at the sunburn on my neck, which I was not aware of. From the top of Pitstone Hill there were some superb views, and I could clearly see the top of Ivinghoe Beacon ahead of me. It was quite warm at this time, and as the path dropped down off the hill to reach a road I started to overheat, and this got worse as the path started to climb once more, initially gently before becoming steeper along the side of Inchcombe Hole. Because of the heat I took the climb slowly, watching a man climb directly up the steep side of the hole, but once I reached the top I found that the slight breeze cooled me off. The path dropped once more to meet a road, before climbing once more over a little hillock before tackling the last ascent of the Ridgeway to reach the trig pillar that marked the end of the Ridgeway and the start of the Icknield Way. The area around the pillar was packed with people, so I retired a few yards and shrugged my pack off into the grass and lay down beside it, letting the afternoon sun dry the sweat that lay on my clothes. A man was flying a remote-control glider from near the trig pillar, and I watched him expertly fly the plane to and fro. Ivinghoe Beacon meant that I had finished the Ridgeway, but the pleasure that I should have got from this achievement was blunted by the fact that I still had many more miles to walk today before I could pitch my tent. A swarm of insects were around me as I lay down, and these proved so annoying that I did not spend as long as I wanted lying down, and got up just as the glider pilot approached, ready to pack up for the day. We chatted for a few minutes, and he claimed that in a day I could be taught the basics of flying the glider. It was a pleasant chat, and is something that I would not mind looking into in the future, although I find making models more interesting than flying them. I retraced my steps to the road, beside which there is a stone block marking the start of the Icknield way, the sibling of the ones at the end of the trail at Knetishall Heath and in the middle at Balsham. I took a photo of this before following the path that skirted the edge of a field, with some pleasant views back towards Ivinghoe Beacon. These were soon left behind as the path headed southeaswards and entered an area of woodland that I could clearly remember from when I had walked this stretch of path before. A short but steep climb followed up some steps through the woodland, and on these I stopped to chat to a couple walking in the opposite direction. The path emerged from the trees near Ward's Hurst Farm, before starting a long descent along path and track down to the main road in Dagnall. I had used up most of the water that I had bought in Wendover, and as I still had time to spare I decided to stop off at a pub for a break. The first one that I passed seemed to be shut and lifeless, but the second, the Golden Rule, was open. I ordered my usual drunks and sat down as the barmaid kindly filled up my water bottles for me, and after this we chatted away about the local area. The chat to the barmaid was very pleasant, and it was interspersed with a read of the newspaper that had been left out for customers. Every minute that I spent in the pub would be a minute less in my tent, but I had to be careful to leave myself enough time to get somewhere suitable whilst it was still light. Eventually I decided that it was time to leave, and the lass gave me my water bottles from the fridge where she had put them to cool down. After thanking her I raised my rucksack onto tired shoulders and headed out of the pub into what were now much cooler temperatures. A short path led to a steep climb up through trees, and at the end of this there was a golf course. I carefully followed the white posts across the course, and said a quick hello to two children who were practising putting on a green. There were a few other golfers about, but I safely got across and immediately met the fence that separates the trail from Whipsnade Zoo. On the other side of the fence I could see some animals, but there were not as many about as there had been on the previous occasions that I had walked along here, probably a sign of the lateness of the hour. As I walked I kept a lookout for somewhere suitable to erect my tent, but the area around the path was either too overgrown or narrow. As I had walked the path before I knew what was coming up, and I could remember a little area of woodland where a path met the trail to the west of Holywell. When I reached this point it seemed like a good spot, and I walked around through the trees for a couple of minutes to find a suitable place to pitch my tent. Unfortunately I could not find a good spot in the trees, and so I walked out a short distance along the other footpath until I found a flat spot right beside the path that was just large enough for my tent. I pitched the tent quickly as it was starting to get dark and settled in for the night, watching the stars start to appear in the skies overhead. After a minutes I heard noise outside the tent, and suddenly a dog was sniffing at the mesh flap of the tent, immediately followed by voices as a couple approached. We exchanged greetings as the dog attempted to lick me through the mesh, the saliva remaining long after it had run after its owners. It had been an amusing incident, and I smiled at it as sleep slowly overtook me, despite itching from a few insect bites that I had got during the day. P20078260021	The descent down from Ward's Hurst Farm. P20078260025	The path climbing east from Dagnall. P20078260031	My tent near Whipsnade Zoo. This makes a total distance of 26.6 miles, with 3188 feet of ascent and 3212 feet of descent.